Right now the rescue teams in the Brazilian state of Minas Gerais are seriously searching for more survivors, after a dam burst at an iron ore mine on Friday, releasing a torrent of sludge and mud, which has caused serious problem and has led to the dead of many present in the area. Though many have been rescued and many locals evacuated as a precautionary measure, but more have been found missing than rescued. According to Fabio Schvartsman, the head of the Feijão mine owned by Vale SA., about 200 of the 300 workers are still missing. The sludge swept through the mine's offices and the cafeteria at lunchtime on Friday. 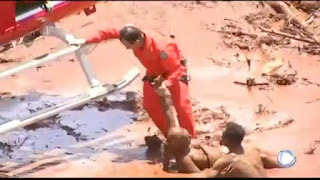 And according to report, seven dead bodies were found in the hours after the dam burst, but the toll was expected to rise sharply, said Avimar de Melo Barcelos, the mayor of the nearby town of Brumadinho. The state is still recovering from the collapse in November 2015 of a larger Samarco owned dam in Mariana that killed 19 people in Brazil's worst environmental disaster. It buried a village and poured toxic waste into a major river. Schvartsman said the dam at Feijão was being decommissioned and its capacity was about a fifth of the total waste spilled in 2015. He said equipment had shown the dam was stable on Jan. 10 and it was too soon to say why it collapsed. That is one great loss in the country this year.